It may seem silly to describe the areas of the course in a video, especially if you have already been playing for a while. However, in 2019 the new rules of golf contain quite a few new terms. Knowing the Defined Areas of The Course will help you understand which rules apply (or don’t apply) in certain areas of the course. Rule 2.2 Defined Areas of the Course. The General Area covers the entire course expect for the four specific areas of the course described in Rule 2.2b. It includes every type of ground and growing or attached objects found in that area, such as fairways, rough and trees. 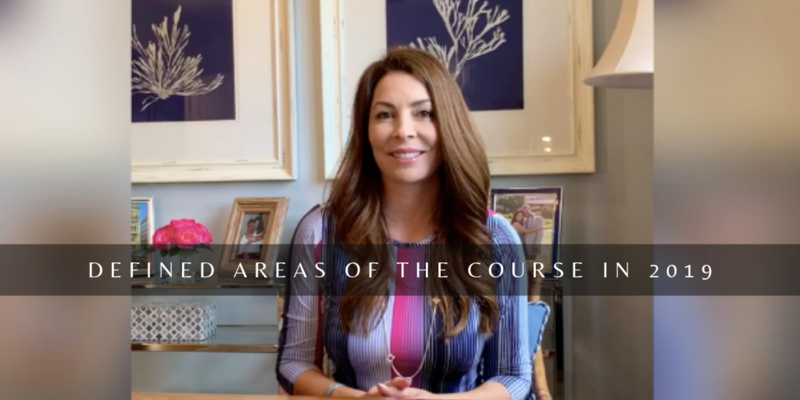 Take a peek at the video below for the foundation of the Defined Areas of the Course. Rule 2.2c The area of the course where a player’s ball lies affects the Rules that apply in playing the ball or taking relief. If part of the ball is in two specific Areas of the Course, it is treated as lying in the specific are that comes first in this order: Penalty Area, Bunker, Putting Green. TIP: A fun way to remember this priority list is to think of a PB&J sandwich, but PB&G (Penalty, Bunker, Green). Read my blog about encouraging other women to play here!